We installed a window covering that very few people even know about: “Window Shadings”. 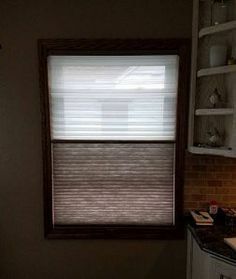 This is a very unique window treatment that accomplishes several things. 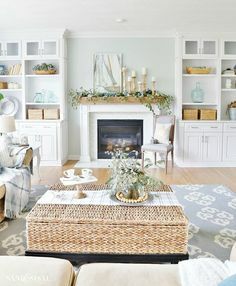 Think of have the privacy and light control of blinds while having the soft texture of sheers along with its ability to blend colors in with the decor of a room. If this sounds like the best of all worlds, that’s because it is! Window Shadings have soft 2 ½” inch, s-shaped vanes…made out of fabric! The vanes are suspended between two sheer pieces of fabric. The sheer material softens the incoming light and help filter out harmful UV rays. At the same time, the window covering preserves the view to the outside. 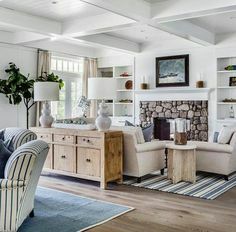 When the vanes are tilted open, they catch the light and spread it throughout the room. When they’re closed, they provide privacy and light control. The photo at the top of the page shows the vanes opened, while the photo below shows the vanes closed. Notice the difference! But, we’re not done yet! Just to add an additional factor of convenience for this client, the Window Shadings were motorized. In other words, the vanes are tiled by remote control! 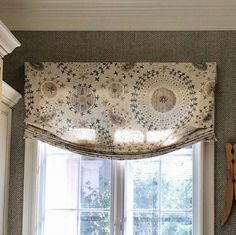 Not only will this be a huge time saver for the client, as she won’t have to be running around manually adjusting each window covering, but since she doesn’t have to touch the window covering they’ll be less wear and tear and less chance of the fabric getting soiled over the years from the oils on her hands. So, remote control was a smart idea! So, let’s take a look at the different parts of this project. Cornices – Handmade wooden cornices, stained to match and accentuate the beautiful wood of the French Doors along with its trim. Window Shadings – Providing privacy and light control, while adding a soft texture to the decor of the room. Motorization – The Window Shadings are motorized window blinds to provide ease and convenience for the client, and prolonging the life of the window treatment by reducing wear and tear. French Doors and matching side doors with handmade wooden cornices and motorized “Window Shadings” from Alta Window Fashions, provided and installed by Bellagio Window Fashions. Obviously, not all projects have to be this elaborate. 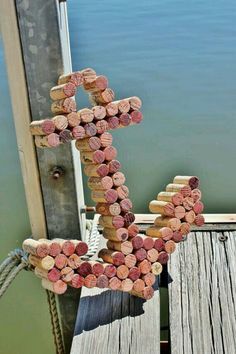 But as you can see, sometimes you can combine ideas to create a unique effect that will personalize your decor. So if you’ve been thinking about what can you do with your French Doors, hopefully this may give you some ideas. As a side note, I’ve been recommending and installing Window Shadings in clients’ homes for years and they all love them! The other thing people love about these is the price. 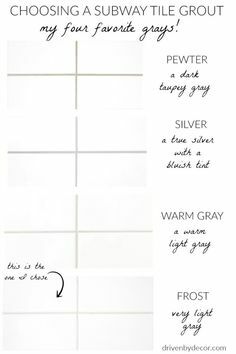 These are a great alternative to a well-known, “high-end” window treatment that some clients have asked for by name. I can (and do) provide that product but, in my opinion, Window Shadings are extremely well made by a manufacturer I’ve worked with for years. They stand behind their products 100% and have great customer service. 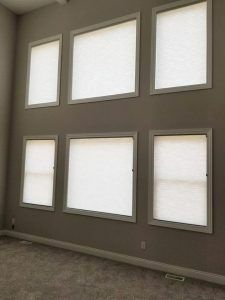 So, in other words, if you love this type of window treatment but the “higher-end” product is out of your budget, consider this alternative – you definitely won’t go wrong. I’m so proud that Bellagio Window Fashions was chosen to represent Alta Window Fashions as a part of their “Elite Partner” program. (You can read about that by clicking here.) We are one of only four companies in Ohio and the only one in Toledo to have this designation. If you’d like to know more about these or any other window treatment options for French Doors (or any other project you may have), just call Bellagio Window Fashions or you can contact me by email (click here). But before you do, please leave a comment and let me know your thoughts about this post. 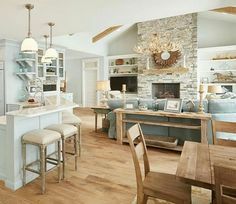 This entry was posted in Cornices, Design Ideas, French Doors, Motorized Window Treatments, Shades and tagged in cornices, French Doors, Kathy Ireland Home by Alta, Window Shadings.